From 1 to 100 we will make it an occasion to remember including the red (or pink!) carpet treatment and balloons. 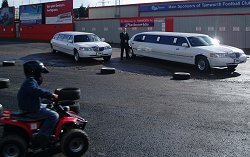 Your child and their friends will love the unique experience of travelling in one of our super-stretch limousines. We supply pink soda and balloons. The cars carry 8 passengers and are fully fitted with seat belts (Seat belt laws also apply to limousines - passengers under 14 years of age must wear their seat belts at all times). 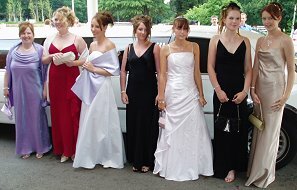 Arrive at your prom in style in one of our stretch limousines. 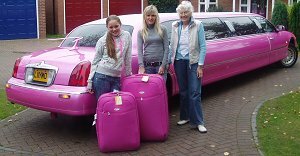 Choose from our pink or white super stretch limousines. Each seat up to eight people. Have a night to remember starting and finishing in style in one of our stretch limousines. 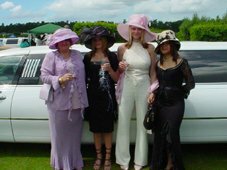 Hens can have the perfect pink limousine and stags enjoy the style of our white stretch limousine. Our luxury limousines have space for your food and wine etc. We will supply the table and chairs. Our experienced drivers will see to your every need from pick up to drop off. Use Lichfield Limousines for your next trip to or from any UK Airport. Experience the comfort, and peace of mind that a great limousine service can provide. Whether you're travelling for business or pleasure, you'll be free to relax or conduct business... without the hassle of driving in heavy traffic, parking and carrying your heavy baggage. We'll greet you with one of our air conditioned limousines and ensure that you arrive safely and on time at the airport or your home, office or hotel. You have a date for the concert, you have your tickets and you're ready to go. You and your party need only to make one final decision...The Limousine! 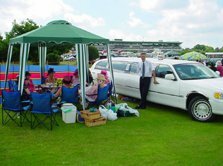 Lichfield Limousines have put together a package that is designed to please everyone. Our luxurious vehicles have all the latest equipment for you and your party to enjoy. Your experienced chauffeurs know exactly what to do and we promise to get you there and back safely in luxury and comfort. 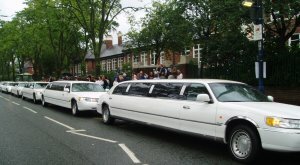 Celebrate your last day of school by travelling in a stretch limousine! We can decorate our cars with black ribbons for funerals. If you want to impress an important client, lay on luxury transport for a special business occasion, or to take your staff out for the day or to the Christmas party, we can accommodate all occasions.